There have been 9 pedestrian fatalities, 12 vehicle occupants killed in traffic accidents in Crewe between 2001 and 2010, and NO cycling deaths. The biggest risk to everyone is obesity and heart disease. We can tackle both of these by allowing ourselves the opportunity to exercise naturally. "Regular physical activity can reduce the risk of many chronic conditions including coronary heart disease, stroke, type 2 diabetes, cancer, obesity, mental health problems and musculoskeletal conditions. Even relatively small increases in physical activity are associated with some protection against chronic diseases and an improved quality of life." A dim decision for street lighting? Street lighting is being removed and reduced on roads around Crewe, and the Nantwich Road and Mill St lights will be dimmed to 60% of normal strength to save money. The Royal Society for the Prevention of accidents (ROSPA) say that the presence of lighting not only reduces the risk of traffic accidents, but also their severity. Surveys have shown that the public are in favour of street lighting as a way of improving road safety and that, if anything, it needs to be improved in some areas. There are economic and environmental reasons why some organisations may wish to reduce the amount of lighting. However there are safety reasons why lighting needs to be available. An unconsidered removal or reduction in quality could actually increase accidents and their severity. Therefore, when considering removal or dimming of lights, location based traffic and accident evidence should be assessed. Accident rates should be monitored to ensure that sacrificing the quality of lighting does not unduly increase the risk. Increases in risk may ultimately lead to lives being lost. Are dark streets a dim idea for walkers and cyclists? 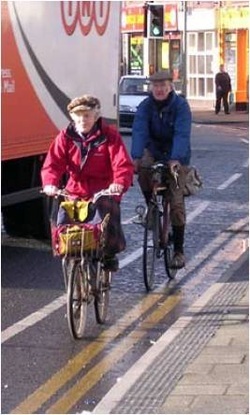 These two cyclists have been regularly cycling around Crewe for many, many years. Proof of the safety and health giving properties of regular exercise!